Slovakia (Slovak Republic) is a country in the Central Europe. The country covers an area 49,036 km² and its population compromises of 5.44 million people. Before 1993 it was a part of Czechoslovakia. The official language is Slovak. There are round 3100 schools (all levels) of which 93% are public, 4% private and 3% church schools. Public (state-run) schools are under the supervisory of the county and cities (primary, secondary), universities have it own law identity. Education is compulsory for 10 years from age 6. It's free of charge. There is a nationwide test Maturita at the end of secondary school (not compulsory), which consists of up to five subjects (mother tongue, mathematics, science and humanity subject). Home schooling is not allowed in general. Kindergartens are not compulsory. There are around three thousand kindergartens of which 1,2% are church and 0,8% private ones. Children have to be 3 years old (2 in some cases) to attend. Parents have to pay a fee, but the total costs of kindergarten care is co-financed by the state or municipality. Parent use to bring their children between 7-8:00 and take them home between 15-16:00. Cooperation with primary schools are mostly done only in a visit at the primary school for those finishing the kindergarten. There are round 2300 primary schools, of which 1% are private and 5% are church schools, with average size of 30 students. Children are divided into classes on the first day and stay so until the graduation. School starts at 8a.m. and lessons take 45 minutes. From 1st to 5th grade there are 4-5 lessons a day, later on up to 7 lessons a day. All books must be certified by the ministry, except some language books all are free of charge. Subject "Religion" (only Catholicism) is compulsory, or substitutable with subject "Moral". Grading system 1 (best) to 5 (worst) is used, where in the first year only descriptive "pictures" are used. There are no uniforms, except some private schools. 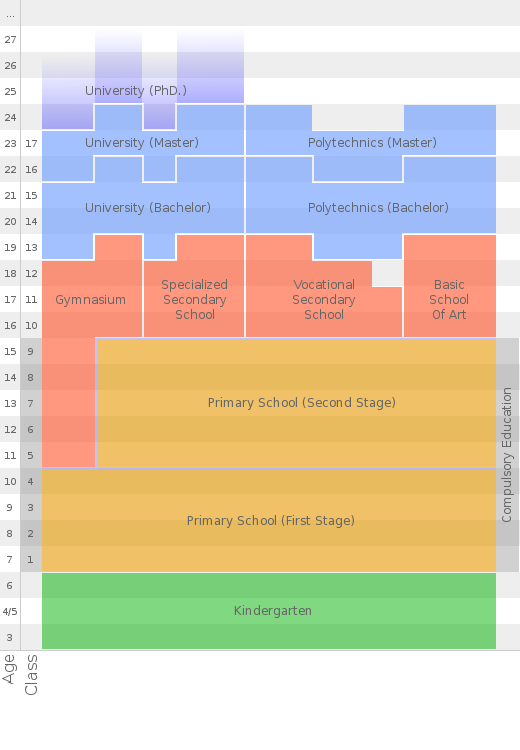 There are some extracurricular activities available, but depends a lot on the school (teachers) itself. There are no own subjects to choose from. There are hardly any computers available to the students. There is warm food available for all students at school, states pays half of its price. There are new nationwide "9th grade leaving exams" just being tested now, they should substitute the entrance exams to the secondary schools. Alphabet picture. There are around 8 hundred secondary schools of which 11% are private and 9% are church schools. Gymnasium (general) are making 29%, professional 46% and vocational 25% (and some artsμsic schools). Class size on average is slightly more then 30 students. Students are divided into classes in the beginning and stay so till graduation. The year is divided into two terms, the schedule is done at the beginning of the term and stays the same all the time. The day starts at 8:00. with the first lesson, however a "zero" lesson starting at 7:05 is used at some schools. Day usually end around 13-14:00, which mean 5-7 lessons a day. Some, mainly vocational schools are having shifts - 7:00-13:00 and then 13:00.-19:00. Children graduating from primary school can freely choose a school they want. However to enter most of the better schools there are entrance exams (slovak, math, other) - and since most of the exams are done on the same day, so one can only try to enter one school, students are going for those ones where they have bigger chances to achieve. Depends a lot on the school, but higher the grade, the more elective subjects are available, 3-4 own subjects are common in graduating year. Grading system 1 (best) to 5 (worst) is used, for some subjects points and percentage scale is used during the year, at the end it must be however translated to a single note. There are school counsellors available at almost all the school, but usually there are also full time teachers and therefore do not have enough time to do proper counseling. There are not many extracurricular activities available generally, but the better schools try to offer also after-school program and make use of their facilities. All of the school are equipped with computers and internet, students have access to them in different forms in general. There are no school uniforms except for some private schools. There are warm meals available at all schools, state is paying half of its costs. Leaving the secondary schools (except some vocational types of school), one has to take the "Maturita" tests - nationwide tests in Slovak, math, foreign language and selective. It has two parts (written and oral) and its plan to substitute entrace exams to university but it is not yet true. There are 23 public and 10 private universities. Most of them apply entrance exams. Public ones are free of charge, although some small fees may apply. Total exclusion, all students with disabilities are attending special schools. Possible attendance of a "normal" school is a subject to the school director's approval. In pre-primary education, talks about the compulsoriness of the last year of kindergarten are taking place. In primary and secondary education, current government plans to start a "new school" (reform) from September 2008, with less curricula and more de-centralization, but the public is very sceptic. In the higher education, very often attempts to charge for educations occur, till today with no success. Študenti v pohybe dopadli dobre, pozrite ako ..